While sewing machines are designed to make the completion of fabric projects easier, nothing is more frustrating than having a big tangle of thread pile up underneath your sewing project. While this is a frustrating situation, there are several reasons why your thread may be tangling up, and nearly all are easily fixed. A tangled bunch of thread under your sewing project is frustrating, but simple to correct. 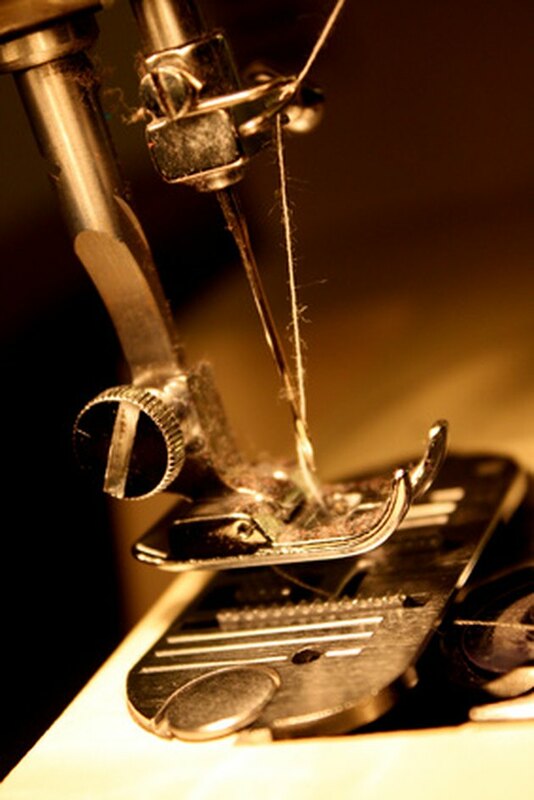 Sewing machines make stitches by using the needle to intersect the upper thread with the lower bobbin thread. The sharp point of the needle catches the bobbin thread, which makes a loop. This interaction creates knots, which are the building blocks of sewing machine stitches. If the needle is dull, this process may not work properly, causing a knot to get caught in the bobbin thread area instead of in the fabric. Changing your needle corrects this issue. If your sewing machine thread is not properly threaded, the bobbin thread won't be pulled up into the fabric the way it needs to be. Occasionally the upper thread can catch on a moving part or get stuck, which impedes the easy flow of thread through the needle, creating a tangle. Unthreading your machine completely and rethreading it will correct this issue. The bobbin must be placed properly into the bobbin case or it can unwind the wrong way. When this incorrect unwinding occurs, the bobbin's thread doesn't interact correctly with the upper thread. The knots it needs to make to form the stitches aren't made and the thread, instead of making knots, makes a giant, tangled mess underneath your sewing project. To make sure this doesn't happen, or to correct the problem if it does happen, place the bobbin in the case so that the thread unwinds in a counter-clockwise motion, with the thread being pulled from the left side of the bobbin to the right. To make the knots in the fabric, both the upper and lower threads need to feed evenly through the machine. This is controlled by the tension, which often needs to be adjusted for different kinds of fabric and needle sizes. If your fabric is puckering or the machine is skipping stitches in addition to developing tangles under the fabric, poor tension is most often the culprit. To adjust the tension on your upper and bobbin threads, consult your owner's manual.